Trump Administration Reveals Plan To Limit Lead Exposure, Critics Say It's Not Enough The Federal Lead Action Plan is a framework rather than a call for new regulations. The plan seeks to bolster efforts to communicate the dangers of lead exposure. Critics say it doesn't go far enough. Acting EPA Administrator Andrew Wheeler said the Trump Administration plans to tackle the issue of of lead exposure "head on." Wheeler seen here during a Senate Committee hearing in August. The Trump administration Wednesday unveiled a multi-agency plan to reduce the number of children exposed to lead in drinking water, consumer products and dust generated from old lead-based paint in homes, schools and soil. 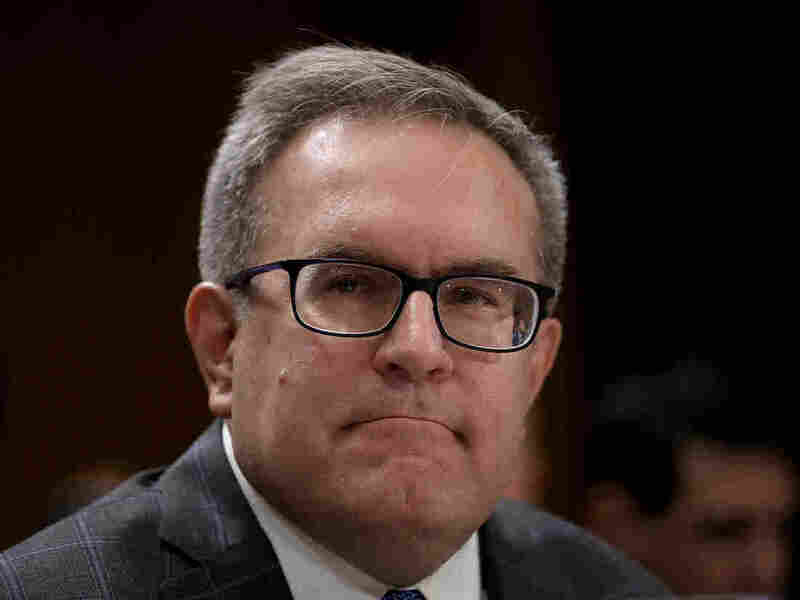 During the unveiling ceremony, Andrew Wheeler, the acting Environmental Protection Agency administrator, referred to the Federal Lead Action Plan as a "roadmap to reduce lead exposure nationwide," a nod that this is a broad strategic framework rather than a proposal to introduce new regulations. The stated goals include improving ways to reduce children's exposure to lead, diagnose and monitor children who have been exposed, and bolster efforts to communicate the effects of lead exposure, particularly in poorer neighborhoods and those where residents have limited English proficiency. Erik Olson, senior director of Health and Food for the Natural Resources Defense Council, said this plan unveiled by the administration doesn't do nearly enough. While he praised the administration for its "recognition" that lead remains public health risk, he laments the plan comes without any real enforcement. "This plan does not actually promise to take specific regulatory or enforcement action within any specific time," Olson said in a statement. "Feel-good promises to 'consider' and 'evaluate' actions without time frames or commitments ... won't protect children." The plan released today by the President's Task Force on Environmental Health Risks to Children did not address the EPA's Lead and Copper Rule, which dictates utilities minimize amounts of lead in water. That rule was written in 1991 and has not been significantly changed since. Lead seeping into drinking water caused a public health crisis in Flint, Mich., leading to the Obama administration to declare an emergency declaration for the entire state in 2016. Wheeler, the acting head of the EPA, said more details about those changes would be due out next year. Ben Carson, the head of the Department of Housing and Urban Development, did make one concrete announcement Wednesday. HUD is awarding more than $139 million dollars in grants to 48 state and local government agencies to protect children and families from lead-based paint. Carson, a former pediatric neurosurgeon, said during his years practicing medicine he was made "acutely aware" of the impacts lead poisoning on a child's development. "I'm committed our department's resources reach the doors of high-risk Americans at the prevention stage, long before the children are exposed to dangerous chemicals for which they might later need a cure," Carson said.